Heat oven to 425°F. Line 15x10x1-inch pan with cooking parchment paper. In medium bowl, mix orange juice, brown sugar, orange peel, ginger and garlic. Add scallops; toss to coat. Place 1 scallop in each mushroom cap. 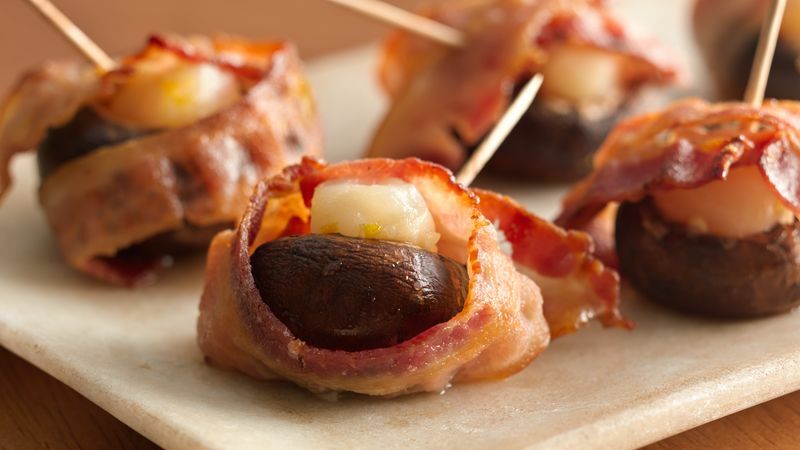 Wrap each with 1 bacon slice, enclosing scallop. Secure with toothpick. Dip in orange juice mixture; place in pan. Bake 8 to 10 minutes or until mushrooms are tender and scallops are opaque. If desired, replace each toothpick with 4-inch wooden skewer. Look for precooked bacon in the meat department of the grocery store. It gets nice and crispy when baked. If small portabella mushrooms are not available, 1 1/2- to 2-inch white mushrooms will work fine.